MICU 1906: In the land of Calabria and for the family of Olearia San Giorgio, the name Micu has an important value. Dedicated to and named after their Grandfather Domenico “Nonno Micu” born in 1906, he was a farmer, father of ten, and a man with a rough, strong, tenacious character. In 1940 it was he who directed the olive business that in 1992 took the name of Olearia San Giorgio of the Fazari brothers. An oil named for his intense character, only 1906 bottles have been produced and from which the family has selected their best olive trees from the varieties that he loved so much: Ottobratica and Cassanese. These carefully selected varieties have produced an extraordinary oil of medium fruity intensity with pronounced grassy hints and a well-balanced spicy finish. Pour a few drops on boiled hot potatoes, on a plate of raw vegetables or fresh grilled fish and discover how its simple taste takes you on an intense sensory journey. BELVIS DE LAS NAVAS: This sublime, organic mountain extra virgin olive oil is a blend of rare heirloom varieties known to exist only on the Belvís de las Navas estate overlooking Gibraltar and the coasts of Africa, in which only a limited number of cases are produced each year. The 18-hectare estate rests among tall cliffs, steep slopes and narrow, difficult to access terraces that sheltered the olive varieties allowing them to survive unnoticed for decades in a unique microclimate in what is known as the tail of the Subbaetic system. Today the discovery of this ancient plantation has unleashed the opportunity to create a one-of-a kind blend that includes wild organic olive strains which contribute exceptional aromatic complexity to this freshly squeezed olive juice. The grove is managed with traditional non-irrigation methods and strict organic guidelines, which reaffirms the respect to the environment. The olives are collected early in the season and crushed the same day of harvest at low temperatures to preserve the organoleptic and physiochemical properties. The oil is truly unique in flavor and perfectly balanced with aromas of freshly cut grass, ripe tomatoes, artichoke and a hint of almond with a spicy note in the end. FRANTOIO FRANCI ROSE GRAND CRU OLIVASTRA SEGGIANESE: Produced exclusively from carefully hand-picked Olivastra Seggianese olives from a single grove of centuries-old trees in the hills of Montenero d’Orcia in Tuscany. 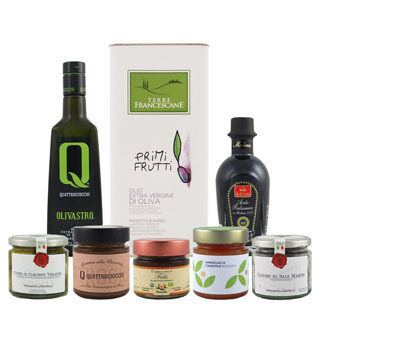 From internationally renowned producer, Frantoio Franci, this extra virgin olive oil is characterized by a clear scent of rose attributed by the wild rose bushes growing amongst the Tuscan grove. Its flavor is fresh and delicate with notes of vegetables, artichoke and a hint of banana. The flavor is well-rounded, fruity and herbaceous. A truly rare and magnificent oil. MAGNA OLEA GOURMET: The exceptional award-winning oil from Northern Portugal is produced from locally-grown Cobrançosa olives and cold extracted within 24 hours of harvest. The oil is medium green with notes of fresh cut grass, tomato, banana peel and olive leaf with a slightly sweet and prolonged spicy aftertaste. Excellent for dipping and drizzling over freshly toasted bread as well as finishing grilled vegetables and fish.